There are a few things that I always carry in my pocket, such as my wallet, keys, assorted pens (usually two Kaweco Sport Fountain Pens), and a pocket notebook. I find that while I carry a few larger notebooks in my bag, I like to have something close by to scrabble notes or ideas on the go. For me, my phone and its associated apps are not enough. This is most likely from the fact that I can process my ideas quicker when writing, and that I just do not type faster than I write on my phone. In any event, I use pocket notebooks for multiple uses, such as quick notes (obviously), passwords, contact information, questions for later reference, and as a peripheral brain (see below examples). Sturdiness: I don't know about you, but I am not kind to my belongings. As such, I want a notebook that can put up with the abuse of being lugged around my pockets all day. Size: It needs to fit in the pockets of my pants. I do not want a notebook that I can only wear certain days a week, or only fit in a jackets pocket. Thickness: I want some pages, but not an overabundance that just makes it to thick and noticeable through my pockets. Quality: Lastly, I want a notebook with good paper and binding that not only will not fall apart, but be a easy to write in and record my notes. 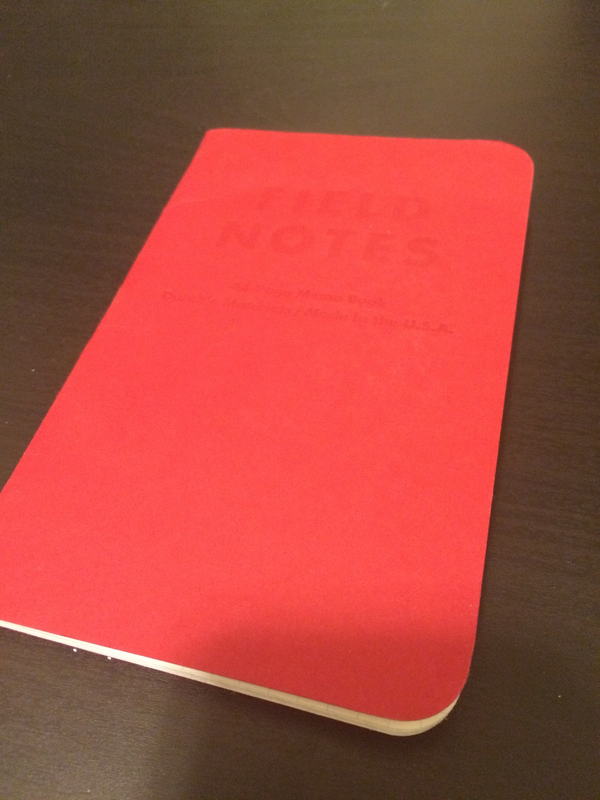 A notebook that seems to be making a big presence, Field Notes are quickly gaining a following in certain circles. Manufactured in the United States, these notebooks are ubiquitous with their heavy paper stock cover and flexible binding. I have used the 48-page memo book, which fits nicely in my pocket, and has just the right amount of pages that makes it easy to transport. It stands up well to different ink, though heavy ink seems to bleed easily through. For me, I like the ability to jot down ideas in these notebooks and then file them away, and I feel that is their greatest strength. They really are meant to be used on the go and then filed after completion. However, while they are sturdy, I have torn them up a bit (catching on my car keys) and the cover has gotten bent up with time, but the paper within is well protected, and staple binding has not fallen apart. Lastly, for those that are planning to travel to the Antarctic, Field Notes produces a line of notebooks called "Expedition Edition" that is practically resistant to everything (e.g. water, weather) due to their use of synthetic paper material. A Japanese notebook, the design seems to have been the spawn of a minimalist looking for a quick but nice looking notebook to carry around. The notebook is quite small (4x2.5'') and contains 78-pages. While not to thick, it is quite flexible. The notebook comes available in Black/White/Orange with a cloth cover. That is probably my biggest complaint, is that I only ever carried it briefly in my pockets before I could tell it was getting beaten up pretty quickly, and looked like it would fall apart with continued use. This is a shame, as it really is a nice notebook, and was useful for storing passwords and contact information on the go. Outside that, I never really found it easy to write in and store long thoughts. It is now relegated to the one of the pockets of my work bag, and retrieved when I cannot remember the password for a certain website these days. I swear, the Japanese make some of the most interesting stationary on the market, and I love them for that. This pocket notebook is sheathed in a plastic covering, with a plastic spring-based ring binding to contain the paper within. That is the key amazing part of this notebook, it was made to be taken apart and put back together again. I found this notebook a great way to create task lists on paper to accomplish on the go. Other fun things I did with it was write notes or things to accomplish on different pieces of paper, and then re-organize them afterwards in order of importance when I went back to reference it. I could then place stuff I finished at the end of the notebook to refer back to when needed. The only issue I had with the notebook was the plastic rings got bent up and I was worried they would break and the whole thing would fall apart. I keep it these days in a suit jacket for meetings and conferences as a quick way to jot down presentations and CE credit codes. If the rings were metal, I probably would use it more often. Great idea, just needs to be constructed a bit differently for me. This was a random buy for me, but I have grown to like the quality of notebooks MIdori creates. Currently I am eyeing their Traveller Notebooks, and will most likely make the buy one day. But in any event, their Grain Pocket Notebook is another excellent notebook crafted with care. It has a nice band that keeps it close, a leather front cover, and thick cardboard backing, and strong metal twist rings. A really nice feature is that half of the pages are lined, and the other half blank. It has stood up well in my pocket and can take a beating. It is also bigger than the notebooks mentioned before, but slightly smaller than a Field Note memo book. I find it great for making lists, writing and drawing notes and ideas in it. The paper is great as well, and puts up with a lot of the ink I use. The biggest drawback, is that it is so thick. It has over 100-sheets of thick paper, which makes it bulge noticeably in my pockets sadly, and can then be cumbersome. If it was slightly smaller I think I would love it more. So, of course, I will mention the classic (or sometimes lauded/hated) Moleskine brand of notebooks. I have used these for several years, and make up most of the notebooks I keep around my office and on the go. I love the paper, the sturdiness of the paper, and the binding. In terms of which ones I have used for pocket use, these include their pocket notebooks (both classic book layout and reporter design), and their mini volant style notebooks. The volant style notebooks are really interesting, as they are the smallest notebook (2.5x4'') I own. However, being smaller is not always best. I find it the hardest things to write in, and in all honesty I try to give the things away at this point, as I find for myself very little applicability. However, I do recall seeing a medical resident using it to keep stickers with certain information in it, to document his interventions. The pocket sized notebooks have been better suited for my use over the mini notebooks, and I use them more frequently. They are a good thickness, fits snuggly in my pockets, and the cover keeps it protected. The biggest complaint is the size, as I feel it could be slightly smaller. It fits in most pockets in my wardrobe at least. I have beaten them up on certain events, and one has fallen apart on me the past sadly, though that hasn't prevented my complete use of them. Of all the above notebooks I listed, I am caught between Field Notes and Moleskine for everyday use. I love the other ones in select situations, but they are either to large, small, or destructible for my personal utilization. I would love to hear from you what you like or use, and any recommendations you may have! For those wondering where I got most of these notebooks, I recommend either Amazon, or JetPens. Could mHealth be used against patients?